This method investigates the platelet-mediated clumping phenotype of Plasmodium falciparum-infected erythrocytes (pRBC) in clinical isolates. This is performed by isolating and co-incubating platelet-rich plasma and a suspension of pRBC. Tembo, D. L., Montgomery, J., Craig, A. G., Wassmer, S. C. A Simple Protocol for Platelet-mediated Clumping of Plasmodium falciparum-infected Erythrocytes in a Resource Poor Setting. J. Vis. Exp. (75), e4316, doi:10.3791/4316 (2013). P. falciparum causes the majority of severe malarial infections. The pathophysiological mechanisms underlying cerebral malaria (CM) are not fully understood and several hypotheses have been put forward, including mechanical obstruction of microvessels by P. falciparum-parasitized red blood cells (pRBC). Indeed, during the intra-erythrocytic stage of its life cycle, P. falciparum has the unique ability to modify the surface of the infected erythrocyte by exporting surface antigens with varying adhesive properties onto the RBC membrane. This allows the sequestration of pRBC in multiple tissues and organs by adhesion to endothelial cells lining the microvasculature of post-capillary venules 1. By doing so, the mature forms of the parasite avoid splenic clearance of the deformed infected erythrocytes 2 and restrict their environment to a more favorable low oxygen pressure 3. As a consequence of this sequestration, it is only immature asexual parasites and gametocytes that can be detected in peripheral blood. Cytoadherence and sequestration of mature pRBC to the numerous host receptors expressed on microvascular beds occurs in severe and uncomplicated disease. However, several lines of evidence suggest that only specific adhesive phenotypes are likely to be associated with severe pathological outcomes of malaria. One example of such specific host-parasite interactions has been demonstrated in vitro, where the ability of intercellular adhesion molecule-1 to support binding of pRBC with particular adhesive properties has been linked to development of cerebral malaria 4,5. The placenta has also been recognized as a site of preferential pRBC accumulation in malaria-infected pregnant women, with chondrotin sulphate A expressed on syncytiotrophoblasts that line the placental intervillous space as the main receptor 6. Rosetting of pRBC to uninfected erythrocytes via the complement receptor 1 (CD35)7,8 has also been associated with severe disease 9. One of the most recently described P. falciparum cytoadherence phenotypes is the ability of the pRBC to form platelet-mediated clumps in vitro. The formation of such pRBC clumps requires CD36, a glycoprotein expressed on the surface of platelets. Another human receptor, gC1qR/HABP1/p32, expressed on diverse cell types including endothelial cells and platelets, has also been shown to facilitate pRBC adhesion on platelets to form clumps 10. Whether clumping occurs in vivo remains unclear, but it may account for the significant accumulation of platelets described in brain microvasculature of Malawian children who died from CM 11. In addition, the ability of clinical isolate cultures to clump in vitro was directly linked to the severity of disease in Malawian 12 and Mozambican patients 13, (although not in Malian 14). With several aspects of the pRBC clumping phenotype poorly characterized, current studies on this subject have not followed a standardized procedure. This is an important issue because of the known high variability inherent in the assay 15. Here, we present a method for in vitro platelet-mediated clumping of P. falciparum with hopes that it will provide a platform for a consistent method for other groups and raise awareness of the limitations in investigating this phenotype in future studies. Being based in Malawi, we provide a protocol specifically designed for a limited resource setting, with the advantage that freshly collected clinical isolates can be examined for phenotype without need for cryopreservation. Platelets can be easily activated through temperature, agitation or storage and therefore they should be handled with care. The use of vacutainers to collect blood for platelet preparation is unavoidable in most clinical situations, but should be carefully considered as suction can potentially cause platelet activation. Due to the clinical protocol used at our research hospital, our samples are carefully collected in sodium citrate vacutainers. We have not experienced any problems with premature platelet activation in this or our previous study 12. We collect blood for platelet preparation from blood group O+ individuals to minimize nonspecific blood group antigen aggregation. Donors have also not taken medication in the previous 7-10 days as some drugs are known to influence platelet function. Collect approximately 5 ml of whole blood from a malaria naive host or 2.5 ml of blood from CM or severe malaria (SM) patients in a sodium citrate vacutainer (BD product number 36276). Centrifuge the whole blood at 250 x g for 10 min at room temperature. Do not centrifuge at 4 °C as low temperatures may cause the platelets to aggregate. Carefully transfer the cloudy supernatant in a clean 15 ml tube. Platelets are easily activated by temperature variations and physical shocks and should therefore be handled with care. Avoid shaking or any jerky movements of the tube. Use a Neubauer's haematocytometer to count and adjust the platelet suspension to >300 x 103 platelets/μl for healthy donors and <150 x 103 platelets/μl from CM and SM patients using 1X phosphate buffer (pH 7.2-7.4; PBS). Make sure to choose a high dilution factor to ease the platelet count and ensure its accuracy. Note: Malaria patients have a reduced platelet count compared to the healthy individuals 16,17,18. Therefore platelet concentrations for CM and UM are adjusted according to the average platelet counts for patients within each malaria diagnostic group. The P. falciparum clumping phenotype is common in CM isolates and displays a strong binding affinity therefore the reduced platelet concentrations does not affect clump size or frequency since platelet concentration is standardized for all CM cases. To obtain PPP, centrifuge a portion of the PRP obtained above at 1,500 x g for 10 min. The majority of platelets are pelleted at the bottom of the tube. Both PRP and PPP can be stored at 4 °C for up to two weeks. Ideally, use fresh platelets for the clumping assay. After 8-10 days most of the platelets are likely to be inactive and probably aggregated. Wash the pelleted pRBC three times with 5-10 ml RPMI 1640 by centrifugation at 370 x g for 5 min. Note: in this protocol all cultures started from approximately 1 ml packed cell volume (PCV) and maintained at 5% haematocrit. Cultures can be started with any PCV of pRBC and adjusted accordingly with uninfected RBC and media to reach desired haematocrit. Place the pRBC in a culture flask and supplement with standard malaria culture medium of RPMI 1640 supplemented with 25 mM HEPES, 5% Albumax II or 10% serum and 40 μg/ml gentamycin to achieve a 5% haematocrit. Permeate culture flasks with a mixture of 92.5% nitrogen, 2.5% oxygen and 5% carbon dioxide before sealing and incubating. Alternatively, the air-tight candle jar method of Trager-Jensen can be used. For pRBC obtained directly from patients, incubate their culture flask for 24-36 hr in a 37 °C incubator in 5% CO2 to get mature parasites. NOTE: Most laboratory and culture-adapted lines are very easy to maintain in culture under standard conditions. There are simple techniques described below that can be used to synchronise different parasite stages to retain growth rate. Prepare a thin blood smear as described below and examine parasite maturation under a light microscope. Place approximately 10-15 μl of blood on one end of a frosted glass slide resting on a flat surface. Touch the drop of blood with the edge of a second slide until the blood is evenly spread across the edge of the second slide. While holding the second slide at a 45° angle, quickly but gently, without exerting too much pressure on the first slide, slide the blood across the first slide to make a thin film of blood that is evenly spread. Air dry. Dip the slide in methanol for 10 sec. Air dry. Dip the slide in 2% Giemsa stain for at least 10 min. Rinse extensively until the water runs clear. Air dry. The purification of mature P. falciparum pRBC is a required step for the clumping assay. Indeed, only mature parasites are capable of binding to platelet receptors as it is at this life cycle stage that the relevant ligands are expressed and protrude from the surface of infected erythrocytes. There are several methods to purify and synchronize asexual stages of P. falciparum. : Late asexual stages can be enriched by Percoll gradient 19; magnetic cell sorting 20 or using the gelatin sedimentation 21 protocol described here. Sorbitol-synchronization selects for ring stages 22, after which the rings are cultured for 24-26 hr to obtain mature stages (with no need to perform gelatin flotation). Plasmagel flotation uses gelatin-like solution to select for lower weight knobbed erythrocytes to remain in solution while the dense ring forms and rosettes sink to the bottom. This technique gives up to 90% purity of the mature stage-infected erythrocytes and can be used for both field and laboratory isolates. However, as previously mentioned, plasmagel flotation removes rosetting pRBC as well as immature stages which could result in a reduced clumping frequency in those samples with a high rosetting frequency. However, the absence of the rosetting pRBC after plasmagel flotation would not affect the clumping assay because rosetting is an interaction of pRBC and uninfected erythrocytes while clumping is pRBCs binding mediated by platelets. The ligand involved in these two traits is different; with mainly complement receptor CR-1 on uninfected erythrocytes mediating rosetting. Prewarm Gelofusine solution and serum/Albumax II-free medium to 37 °C in a water bath. Transfer culture to a clean sterile 15 ml tube and pellet cells by centrifugation at room temperature at 370 x g for 5 min. Carefully aspirate supernatant so as not to disturb the pellet and resuspend cells in an equal volume of Gelofusine and protein-free medium. Transfer mixture to a sterile 15 ml tube and allow to stand for 15-20 min in a 37 °C incubator or until a clear demarcation can be seen between an upper and lower level. Carefully transfer the upper layer to a fresh sterile 15 ml tube and add 10 ml of fresh RPMI. Centrifuge at 370 x g for 5 min and carefully discard supernatant. Assess parasitaemia and developmental stage by thin blood smear and examine under a light microscope as described in section 4. NOTE: Mature pRBC range between 60-90% of infected erythrocytes depending on the initial parasitaemia of the culture. For high percentage of mature parasites, use cultures with an initial parasitaemia of ≥10%. Use a Neubauer's haematocytometer to count and adjust the pRBC suspension obtained after plasmagel flotation to 1 x 108 pRBC/μl. In a fresh 1.5 ml tube, resuspend pRBC at 5% hematocrit, acridine orange at 20 μg/ml final concentration and PRP at 10% of the total volume. Instead of acridine orange, parasite cultures can be stained with 25 μg/ml ethidium bromide for 5 min before use. E.g. For a 200 μl reaction mix, add 10 μl mature pRBC, 20 μl of 300 x 103 platelets/μl for PRP from healthy donors or 150 x 103 platelets/μl from SM patients and 170 μl of protein-free medium. NOTE: The ratio of platelets:pRBC in the final reactions is 20:1. This is important as is allows the maximum clumping frequency of a sample to be determined. If fewer platelets are added in controls then not all clumping pRBCs might have the chance to clump. In the same way prepare the following controls; uninfected red blood cells and PRP, and pRBC with PPP to ascertain the role of platelets in the pRBCs clumping. Transfer the suspension to a 1.5-2.0 ml conical screw-cap vial. Place the vial under gentle agitation by rolling at 10-12 rpm at room temperature. Check for clump formation by a wet-slide prepared by pipetting 10 μl of pRBC ± platelet mix on a glass slide, cover with a glass slip and examine under fluorescence. Sampling can be done at 15-20 min intervals for a total of 120 min. A clump is considered as an aggregate of three or more infected erythrocytes. An example of a platelet-mediated clump assay using approximately 70% mature stages of P. falciparum after enrichment by plasmagel flotation is shown in Figure 2. A clump is an aggregate of three or more infected erythrocytes. Staining with acridine orange or ethidium bromide can be visualized by fluorescence microscopy. Acridine orange is spectrally similar to fluorescein, with an excitation maximum at 502 nm and an emission maximum at 525 nm (green), while ethidium bromide has an excitation maximum at 493 nm and an emission maximum at 620 nm (similar to rhodamine dyes, red). Clumps are easily spotted under the microscope as under normal light they appear as cell aggregates and under fluorescence as spots of green or red when stained with acridine orange or ethidium bromide dyes, respectively, as shown in Figure 2 (30 min time point using acridine orange). The larger the clumps, the larger the cell aggregate appears under normal light and the larger the spots of green or red under fluoresce for the respective dyes. Since the dyes target DNA and therefore stain nuclei, platelets and uninfected RBC are not detected under fluorescent microscopy due their lack of nuclei. Random formation of small pRBC clumps of 4.7±1.6 pRBCs/clump occur after 30 min. The clump size significantly increases to an average of >15 pRBC/clumps after incubation for 120 min with some clumps containing numerous pRBC/clump that could not be visually counted. The frequency of the clumping phenotype is calculated as the number of infected cells present in clumps/1,000 infected cells, counted in duplicate assays. Figure 1. Work flow for clumping experiment. Platelet rich and poor plasma (A) and a P. falciparum-infected erythrocyte culture (B) are prepared and then combined for the clumping assay (C). Figure 2. Clumping of erythrocytes infected by P. falciparum laboratory isolate. Clumps formed by HB3 at time 0, 30 and 120 min in platelet-rich plasma (A) and poor clump formation in platelet poor plasma (B). Adapting clinical isolates to in vitro culture can be a challenge as sometimes longer culture periods are required in order to achieve high enough parasitaemia to allow formation of clumps. With high antigenic variation rates in P. falciparum, the adhesive phenotype of the culture-adapted parasite might not reflect the original infecting parasite population after prolonged times in culture. In order to avoid non-specific agglutination due to blood group antigens, platelet donors should be matched for blood group antigen with clinical isolates used in the same assay, or the universal donor blood antigen group O- used. However, individuals with blood group O- are rare in African sites such as Malawi and therefore platelets commonly used are obtained from blood group O+ donors and have to be matched for blood group. Counting clumps on a wet slide preparation is cumbersome and challenging for image capture as the cells are in constant motion. Usually, pRBC accumulate on the edges of the cover slip or they tend to stick together forming "false" clumps that can be easily confused with real clumps. In order to reduce cell motion, allow the cells to sediment for 15 min at room temperature prior to analysis. The clumping assay is time-sensitive and therefore only allows one sample to be analyzed per person at a time for optimal accuracy. Sampling time points for two different samples can easily overlap, resulting mismatched sampling time points between samples if handling more than one sample at the same time. In such circumstances, sophisticated quantitative software could calculate clump sizes or alternatively cell-specific antibodies could be used to analyze the composition of the clumps. While these techniques could greatly improve the significance of the data, in resource-poor settings where this assay is likely to be used, such techniques and equipment are not readily available. We have described a platelet-mediated clumping assay used for studying pRBC in clinical isolates directly in the field. Platelet-mediated clumping, a characteristic behavior in P. falciparum clinical isolates, has been identified as a distinct adhesive phenotype, frequent in CD36-binding isolates 12,23-24. We have used this assay to identify three main points: 1) a strong in vitro clumping phenotype of P. falciparum isolated from Malawian children that is associated with disease severity and diagnosis 2) novel receptor P-selectin mediaties clumping on platelets together with CD36, 3) the degree of thrombocytopenia present in patients with CM is sufficient to limit the further formation of pRBC clumps in vitro 12. The involvement of platelets in clump formation is demonstrated by examining a wet-slide preparation as described in section 6. Platelets can be isolated from PRP by centrifugation at high speeds in order to minimize blood group antigenic reactions; however, we used whole PRP in order to minimize premature platelet activation from excessive handling and from the high-speed centrifugation. Platelet activity can be measured by platelet aggregation test using weak platelet agonists, epinephrine or adenosine diphosphate (ADP) 25 as described in 26. There are several aspects of the assay that have previously been poorly characterized, one of them being the importance of selecting PRP sources and the effect of blood antigen groups on the outcome of the assay. We prepared PRP from individuals who were blood group O+ and had not taken any medication in the last 7-10 days before blood is drawn as some pharmaceuticals can affect platelet behavior. Other factors that may affect clumping success include pRBC haematocrit, parasitaemia levels and length of the clumping assay. Using high haematocrit and platelet count it would be difficult to tell whether the cluster is truly a clump or whether too many cells are merely sitting together because they are densely packed 15. Clumping also generally increases with longer incubation times. These are all useful guidelines that should be considered when designing clumping studies. We find that samples from different clinical groups can be analyzed in parallel using PRP from the same donor if it is possible to do so, but in limited resource settings such as field sites the transfusion pool is generally limited. It is therefore difficult to have a single O+ donor to standardize the assays. We therefore identified several O+ donors to ensure blood group compatibility wherever possible. Using multiple donors is also helpful in cases of large samples sizes so that burden of blood donation does not fall on only one individual. Sampling points at 15-20 min are much more feasible if a single person is conducting the assays, allowing for wet-slide preparations and performing assay kinetics without sampling times overlapping. Most of the microscopic data is visual and somewhat objective; therefore, it is important that cell counting is verified by more than one person. In that case, handling one sample at a time can allow complete analysis of three to four samples a day depending on personal efficiency. Platelet-mediated clumping can be performed using both clinical and laboratory isolates. For laboratory lines, it is recommended that CD36 binding parasites are used to maximize clumping frequencies. The assay can be coupled with other agglutination assays such as rosetting or used in clumping inhibition assays that would enable the study of receptors on the platelets that may mediate pRBC binding, a poorly understood and examined aspect of this phenotype. This work was made possible by funding from The Wellcome Trust. JM (080964) and SCW (080948) were supported by Wellcome Trust fellowships and DT by a Malawi-Liverpool-Wellcome Trust studentship. Miller, L. H., Baruch, D. I., Marsh, K., Doumbo, O. K. The pathogenic basis of malaria. Nature. 415, 673-679 (2002). Saul, A. The role of variant surface antigens on malaria-infected red blood cells. Parasitol. Today. 15, 455-457 (1999). Miller, L. H., Good, M. F., Milon, G. Malaria pathogenesis. Science. 264, 1878-1883 (1994). Newbold, C., et al. Receptor-specific adhesion and clinical disease in Plasmodium falciparum. Am. J. Trop. Med. Hyg. 57, 389-398 (1997). Turner, G. D. An immunohistochemical study of the pathology of fatal malaria. Evidence for widespread endothelial activation and a potential role for intercellular adhesion molecule-1 in cerebral sequestration. Am. J. Pathol. 145, 1057-1069 (1994). Fried, M., Duffy, P. E. Adherence of Plasmodium falciparum to chondroitin sulfate A in the human placenta. Science. 272, 1502-1504 (1996). Rowe, J. A., Moulds, J. M., Newbold, C. I., Miller, L. H. P. falciparum rosetting mediated by a parasite-variant erythrocyte membrane protein and complement-receptor 1. Nature. 388, 292-295 (1997). Udomsangpetch, R., et al. Plasmodium falciparum -infected erythrocytes form spontaneous erythrocyte rosettes. J. Exp. Med. 169, 1835-1840 (1989). Rowe, J. A., Kyes, S. A., Rogerson, S. J., Babiker, H. A., Raza, A. Identification of a conserved Plasmodium falciparum var gene implicated in malaria in pregnancy. J. Infect. Dis. 185, 1207-1211 (2002). Biswas, A. K. Plasmodium falciparum uses gC1qR/HABP1/p32 as a receptor to bind to vascular endothelium and for platelet-mediated clumping. PLoS Pathog. 3, 1271-1280 (2007). Grau, G. E. Platelet accumulation in brain microvessels in fatal pediatric cerebral malaria. J. Infect. Dis. 187, 461-466 (2003). Wassmer, S. C. Platelet-induced clumping of Plasmodium falciparum-infected erythrocytes from Malawian patients with cerebral malaria-possible modulation in vivo by thrombocytopenia. J. Infect. Dis. 197, 72-78 (2008). Mayor, A., et al. Association of severe malaria outcomes with platelet-mediated clumping and adhesion to a novel host receptor. PLoS One. 6, e19422 (2011). Arman, M., et al. Platelet-Mediated Clumping of Plasmodium falciparum Infected Erythrocytes Is Associated with High Parasitemia but Not Severe Clinical Manifestations of Malaria in African Children. Am. J. Trop. Med. Hyg. 77, 943-946 (2007). Arman, M., Rowe, J. A. Experimental conditions affect the outcome of Plasmodium falciparum platelet-mediated clumping assays. Malar. J. 7, 243 (2008). Beale, P. J., Cormack, J. D., Oldrey, T. B. Thrombocytopenia in malaria with immunoglobulin (IgM) changes. Br. Med. J. 1, 345-349 (1972). Jy, W., et al. Platelet aggregates as markers of platelet activation: characterization of flow cytometric method suitable for clinical applications. Am. J. Hematol. 57, 33-42 (1998). Wilson, J. J., Neame, P. B., Kelton, J. G. Infection-induced thrombocytopenia. Semin. Thromb. Hemost. 8, 217-233 (1982). Wahlgren, M., Berzins, K., Perlmann, P., Persson, M. Characterization of the humoral immune response in Plasmodium falciparum malaria. II. IgG subclass levels of anti-P. falciparum antibodies in different sera. Clin. Exp. Immunol. 54, 135-142 (1983). Uhlemann, A. C., Staalsoe, T., Klinkert, M. Q., Hviid, L. Analysis of Plasmodium falciparum-infected red blood cells. MACS. 4, 7-8 (2000). Goodyer, I. D., Johnson, J., Eisenthal, R., Hayes, D. J. Purification of mature-stage Plasmodium falciparum by gelatine flotation. Ann. Trop. Med. Parasitol. 88, 209-211 (1994). Lambros, C., Vanderberg, J. P. Synchronization of Plasmodium falciparum erythrocytic stages in culture. J. Parasitol. 65, 418-420 (1979). Chotivanich, K., et al. Platelet-induced autoagglutination of Plasmodium falciparum-infected red blood cells and disease severity in Thailand. J. Infect. Dis. 189, 1052-1055 (2004). Pain, A., et al. Platelet-mediated clumping of Plasmodium falciparum-infected erythrocytes is a common adhesive phenotype and is associated with severe malaria. Proc. Natl. Acad. Sci. U.S.A. 98, 1805-1810 (2001). Wallace, M. A., Agarwal, K. C., Garcia-Sainz, J. A., Fain, J. N. Alpha-adrenergic stimulation of phosphatidylinositol synthesis in human platelets as an alpha-2 effect secondary to platelet aggregation. J. Cell Biochem. 18, 213-220 (1982). 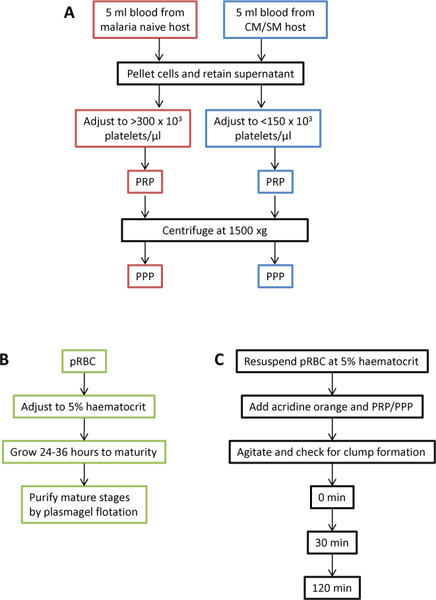 Zhou, L., Schmaier, A. H. Platelet aggregation testing in platelet-rich plasma: description of procedures with the aim to develop standards in the field. Am. J. Clin. Pathol. 123, 172-183 (2005).